Dublin, it turns out, is a great town for all the things I like. Walking. Viewing gardens with water features. Having a pint. Oscar Wilde. Seeing a play. Really good cheese (at breakfast!). Strolling beside a river. Vikings. William Butler Yeats. Our trip began inauspiciously with fears we might miss the connection from Boston to Dublin, but it always helps when you have good onion rings. 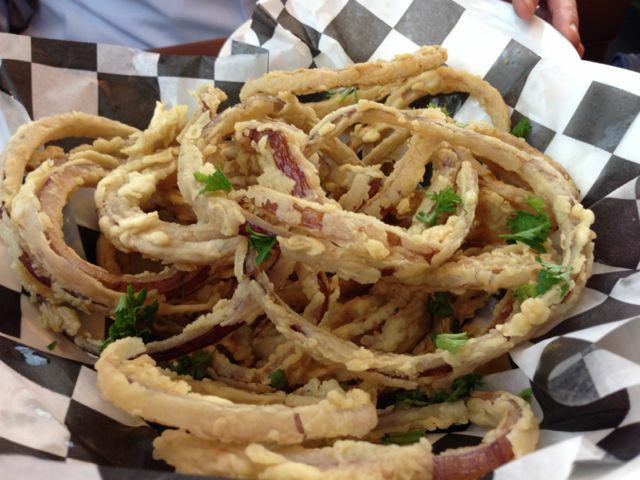 These thin-cut rings are from Great Lakes Brewing Company, served with spicy ketchup and my favorite Eliot Ness Amber Lager! 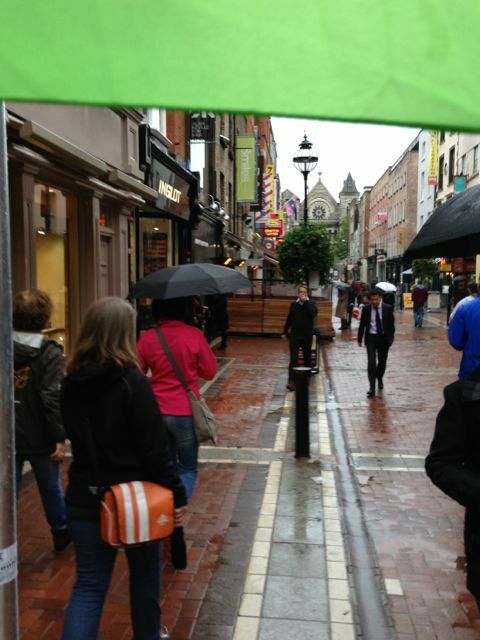 A groggy and jetlagged traveler’s first view of Dublin: Grafton Street on a drizzly October day–from beneath an umbrella. Things are looking up! It turns out that Dubliners have good pizza. 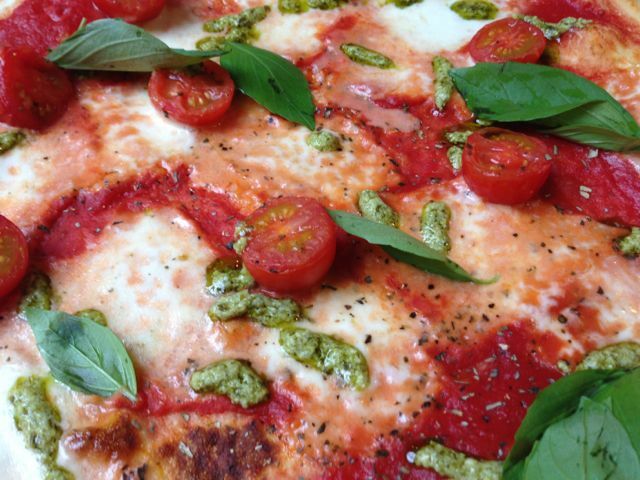 This tomato, basil, pesto and mozzarella pie is from Milano’s. When we arrived at Stephen’s Green, the rain had miraculously stopped, thanks to Saint Ciarán of Clonmacnoise, the heavenly helper who oversees all my Hinds-related travels. 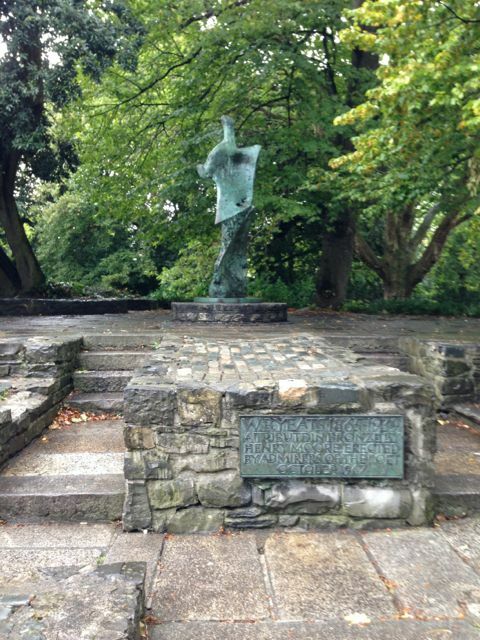 So it was that the Yeats memorial, sculpted by Henry Moore, appeared to my wondering eyes in a nimbus of green light. The spirits of Joyce and Yeats are everywhere in Dublin, which is even more a writer’s town than London. 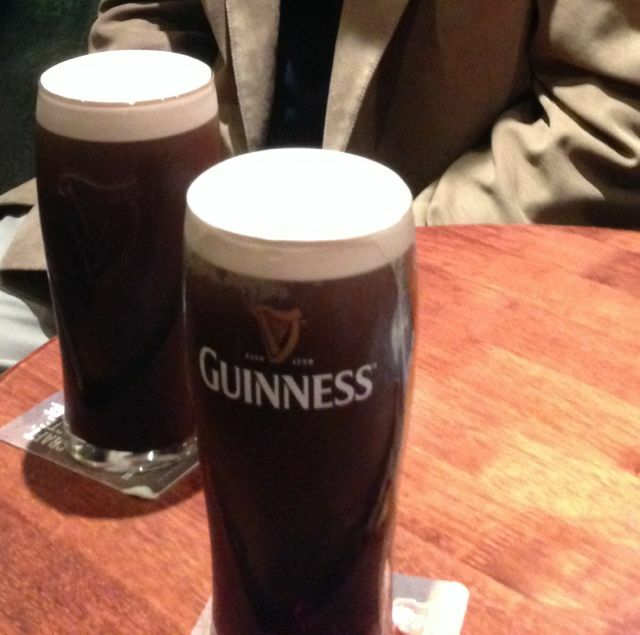 Whatever it is in Dublin that attracts the Muse is far more concentrated. Stephen’s Green immediately became one of my favorite places. I didn’t have time to examine the bookshops or galleries, but there’s nothing like a city where you can see this in a shop window. 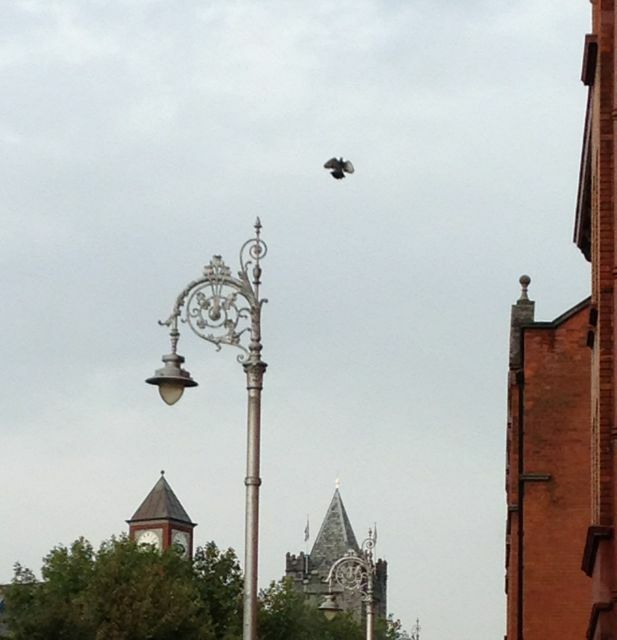 In Dublin, the street lamps are shaped like bishop’s croziers. 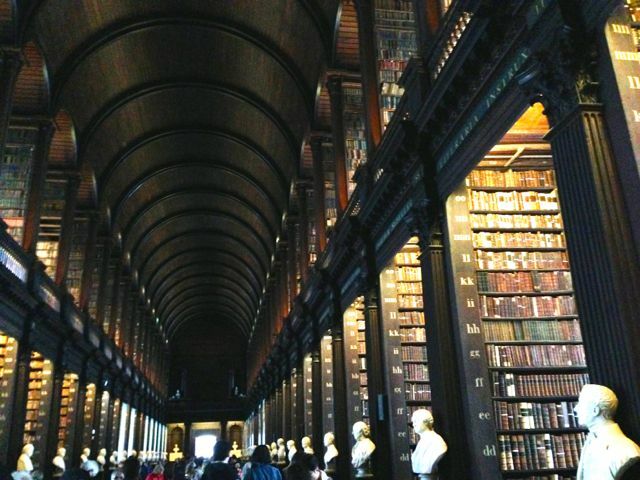 When good little book collectors die, this is where they go: the Long Hall at Trinity College. 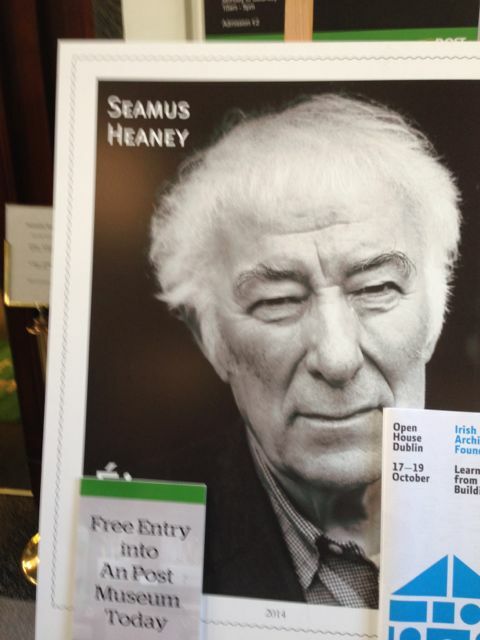 In the National Library there is a permanent Yeats exhibit. 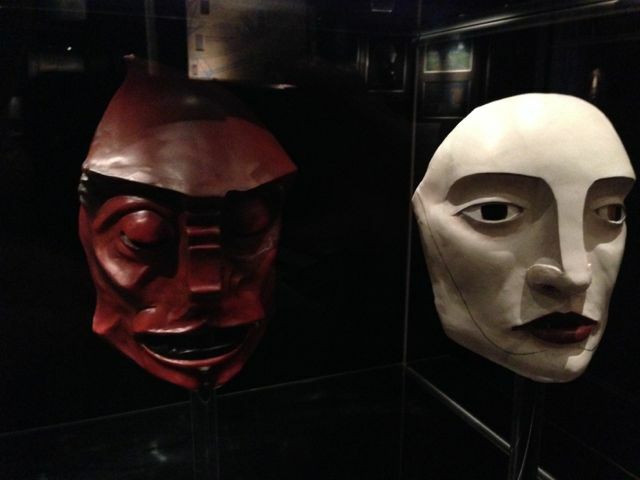 These are reproductions of the original masks used to stage Yeats’ Cúchulainn cycle at the Abbey Theatre. I never get tired of museums. 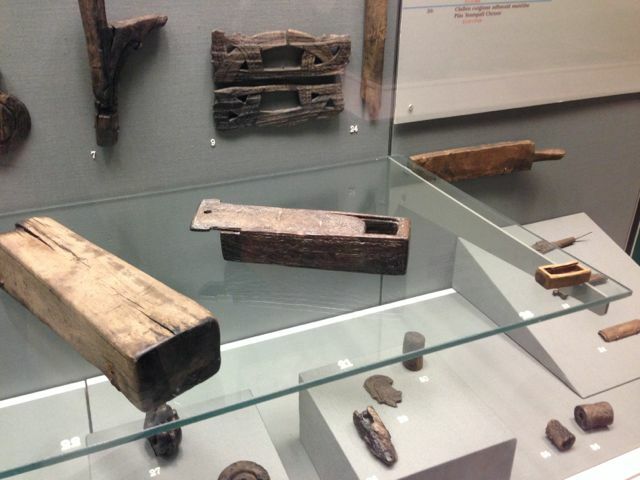 The Archaeological Museum has these nifty Viking artifacts, fortuitously preserved since 800 CE even though they are made of wood. I saw a really massive wooden shoe, and the skeleton of a VERY tall warrior with his longsword. Dubliners seem a bit ambivalent about the Vikings, and no wonder. The heathen Scandinavians terrorized the scholarly Celtic monks who created the Book of Kells and, as Thomas Cahill put it, “saved civilization.” But to their credit, the Vikings founded Dublin… and introduced BEER. While we are on the subject of beer, I do NOT recommend the Guinness Storehouse, which isn’t an actual brewery tour, but a lot of noisy multimedia exhibits housed in a building that seems designed primarily to transport people by escalator to the Gravity Bar on the seventh floor. Here you can have a pint and a 360-degree view of the city, but it’s crowded and… noisy. The General Post Office on O’Connell Street was the center of the 1916 rebellion. 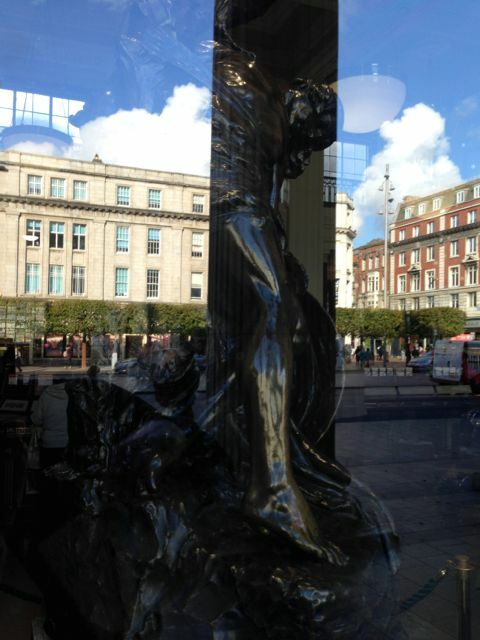 It’s impossible to get a good shot of the famed Cúchulainn statue because of the reflection from the window, but I was pleased with how this one turned out. Just look at that blue sky! The city centre boasts a street called “Setanta Place” after Cúchulainn’s given name, though it’s not much to look at. 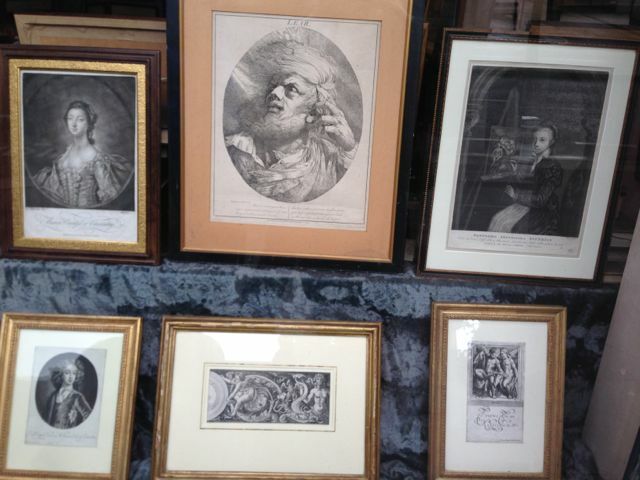 A familiar face in the GPO. Like I said, writers are everywhere in Dublin. Amen. I felt a pang when I saw this. 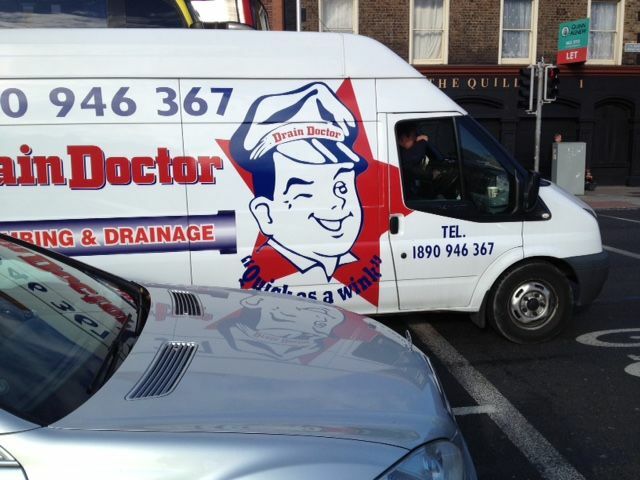 I was floored to spot this van beside the Liffey. There must be some secret international brotherhood of plumbers who use the winking “Mr. Rooter” as their logo. 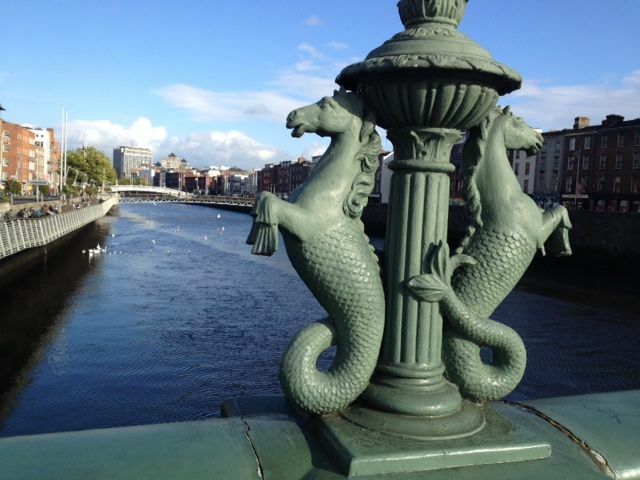 “Sea horses” adorn a bridge over the fabled Liffey river. The sun stayed with us for the remainder of our visit! This photograph drew more comments on my FB album than anything else from Dublin. 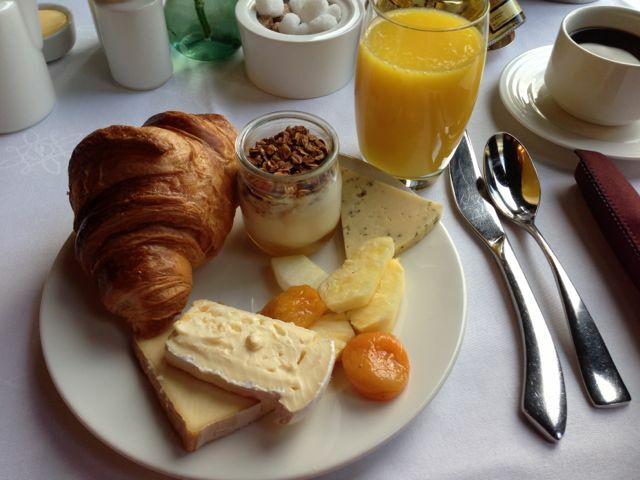 It’s my breakfast in the Westbury Hotel, and I must say that I miss that breakfast now that I have returned to my usual mundane fare. I do love a good croissant! Another familiar face… these posters were all over the city. 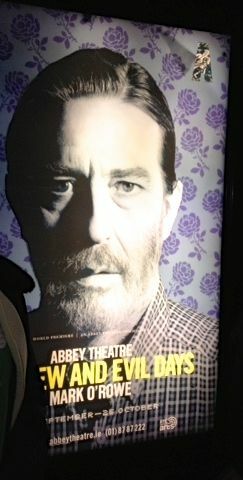 The play we went to see, Our Few And Evil Days by Mark O’Rowe, was part of the Dublin Theatre Festival. Seeing Himself with Sinéad Cusack onstage at the historic Abbey Theatre: Priceless. 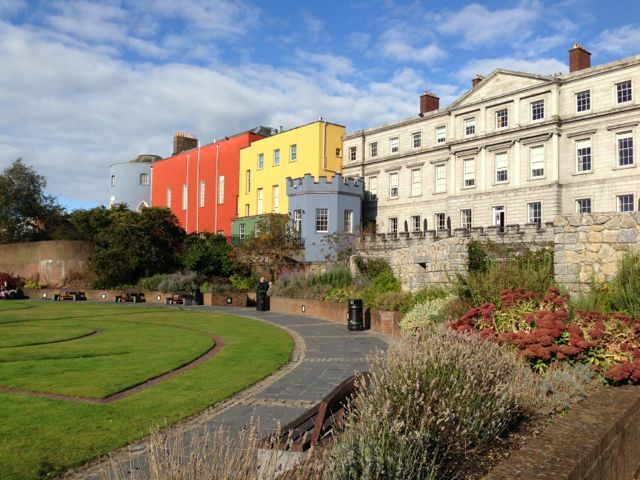 The gardens beside the indispensable Chester Beatty Library and Dublin Castle are beautiful to behold on a sunny day. 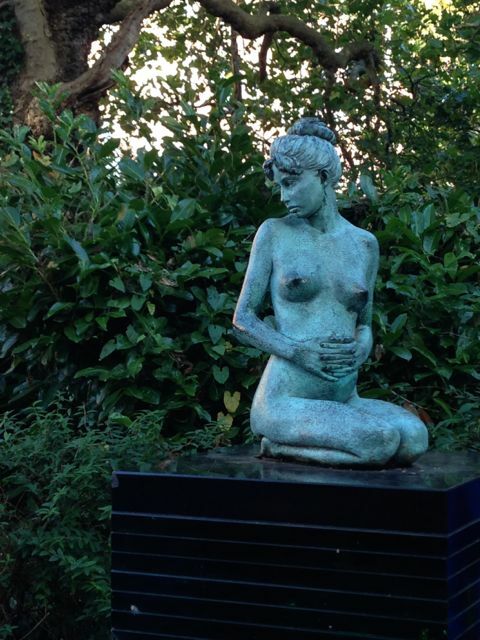 In one of the byways here, there is a touching memorial statue of heroic journalist Veronica Guerin. The Chester Beatty (not in this photo) has some of the oldest Biblical papyri in the world and a huge Islamic collection. 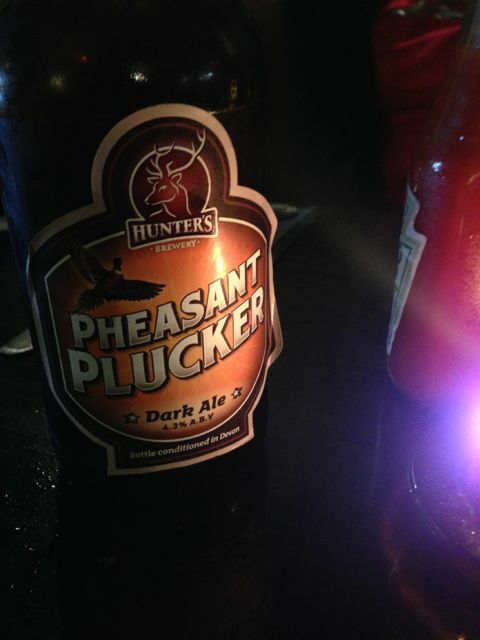 “Son of a pheasant plucker” comes up in a song by the Irish Rovers. Hint: it’s a spoonerism. I highly recommend L. Mulligan Grocer pub, where we had this beer with a ploughman’s lunch and a (vegetarian) scotch egg. L. Mulligan Grocer is worth a visit. 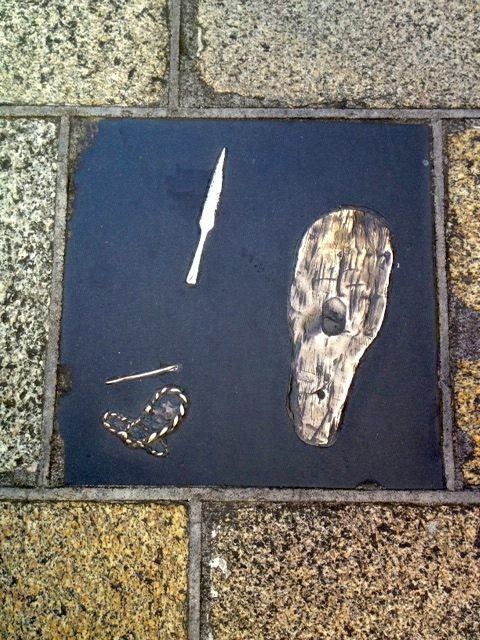 The stretch between Dublin Castle and the river, especially Fishamble Street, has yielded many Viking artifacts. Some of the findspots are commemorated with these plaques showing what was found: spearheads, jewelry and wooden objects. 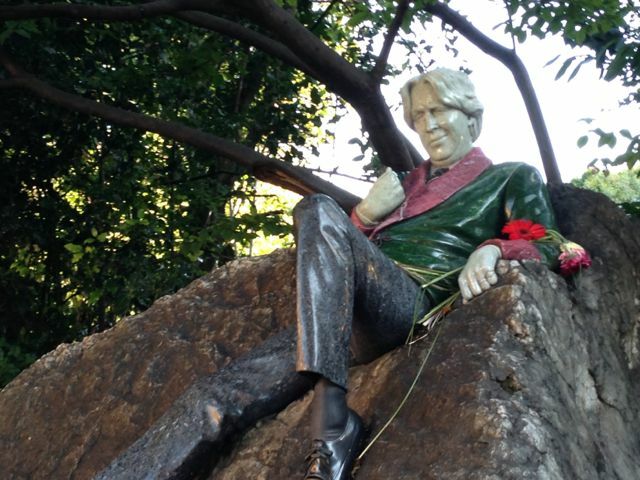 The Oscar Wilde memorial in Merrion Square park is a fittingly stylish tribute. I loved this winsome nymph, who is part of Oscar’s memorial. The back of the set of Our Few And Evil Days may not look very exciting, but there’s something magical about going backstage at a theatre, and seeing how the illusion is created. 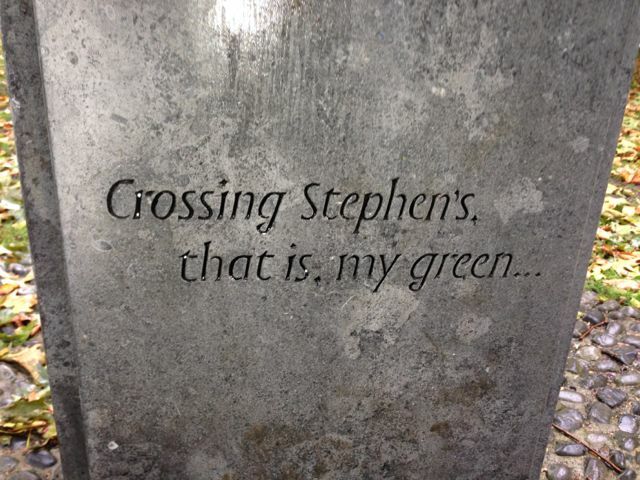 Nowhere is this more true than at the historic Abbey Theatre, co-founded by Yeats. I highly recommend the tour! 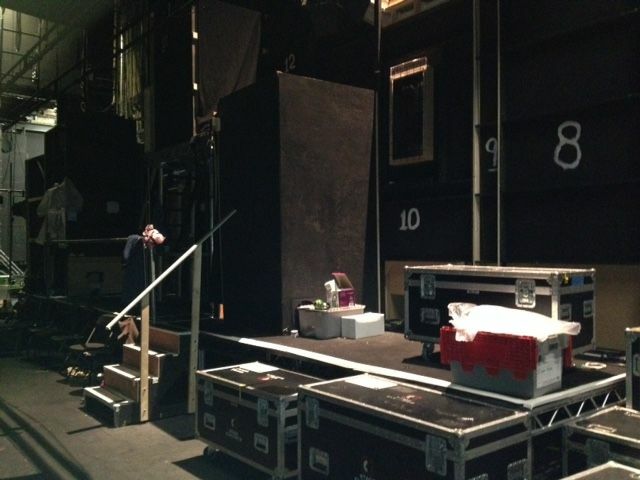 The little rectangular partition is where the actors change clothes between scenes. 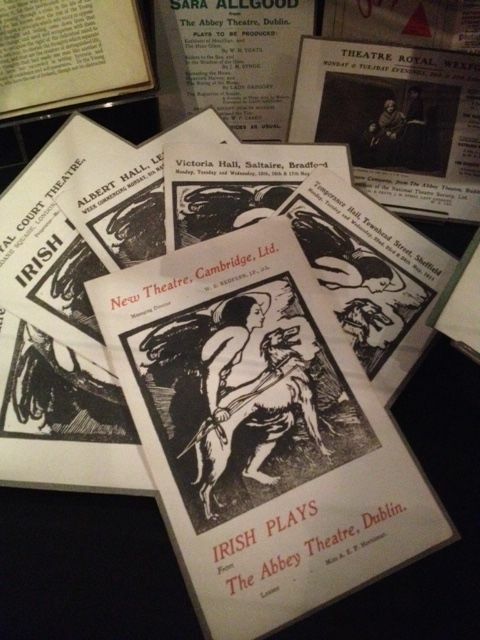 The woodcut logo for the Abbey Theatre shows Queen Maeve with an Irish wolfhound. The archives are being digitized for future generations to study. In all too brief a time (and just as I was recovering from jet lag), it was over. 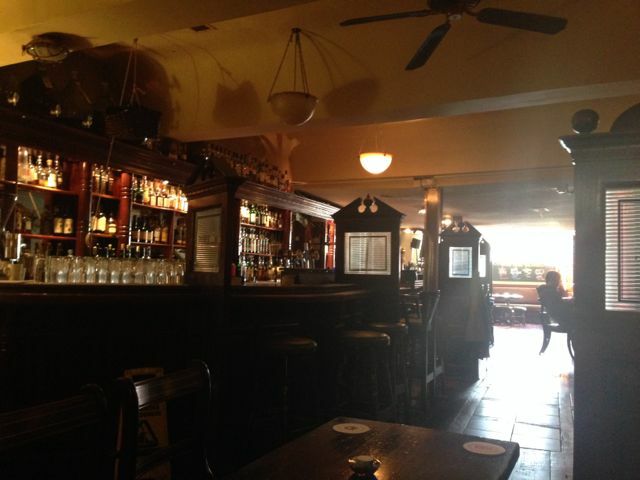 Farewell to our few and giddy days in Baile Átha Cliath, the Town of the Hurdled Ford. We’ll be back. 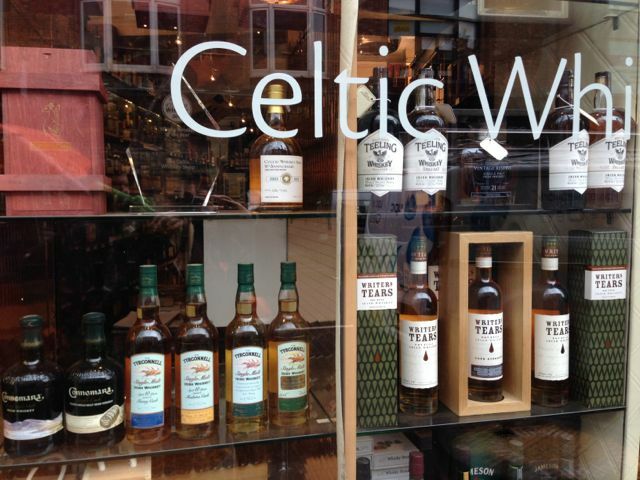 It has been 30 years since the spirits of Dublin visited this visiting Muse. Thanks for bringing back the memories. Yes indeed. I’m still thinking about it. And missing the breakfasts. I can get Guinness here but not good croissants! 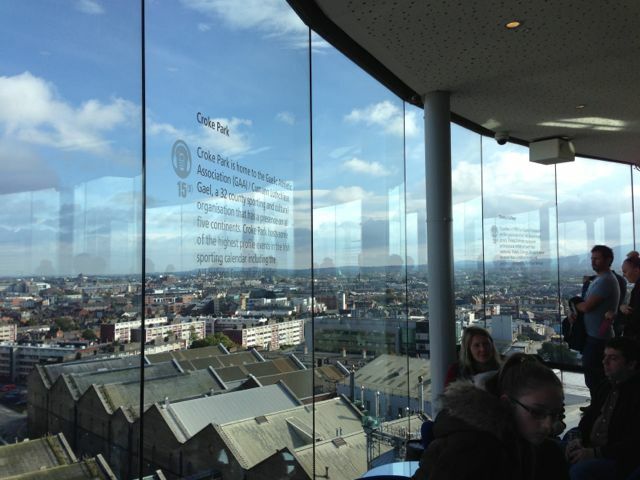 Simply beautiful, Dublin is surely in my places-to-visit list. 🙂 What about the play? Was it difficult to understand the simultaneous chatter? No, it was so skilfully delivered that I had no trouble at all! I’ve got an essay about it ready to go, but I am waiting on permission from the publisher to use quotes from the play. Wow, you really saw and did a lot! And your photos are amazing! Makes me proud to me a Dub, and a bit of a ‘ride’ 🙂 Glad the sun stayed with you – you were lucky! A face like the back of a bus! Ouch! Yes, there is a battle of sexes thing going on. I have noticed it in the banter, especially from men. The ancient and tiny taxi driver who took us to the airport grumbled about how “the lady’s suitcase is always heavier,” and gleefully pointed out to us a sign by the roadway that said “Husband for sale. Never used. Will trade for cat.” It was real–there was a phone number and everything, and she had put it where her husband would see as he drove home. Ha! That sounds pretty hot. A tad bit greasy, though. What a nice tour de Ireland! Pints and croissants can be part of a healthy diet, though I admit that carbs are the culprits when it comes to weight. If you think it’s bad now, just wait till you hit 45… I have to go get on the rowing machine now. I’m really not looking forward to my metabolism slowing down…luckily there are a lot of people in their 40s and up in my Zumba class who are in better shape than I am, so that gives me inspiration. I’m in the midst of a “Biggest Loser” competition with my husband, who is just now starting his diet. I, however, have lost 20 lbs. since Jan. and am in the midst of a plateau. I’m ridiculously competitive, so I cut my calories back to under 1000, and doubled my workouts and started running more frequently. So you can imagine I’m pretty much hungry all the time and sensitive to images of food. Seeing the pizza delivery guy in the neighborhood as I was jogging by sent me into a frenzy. Whereas my husband only cuts back on his ice cream and eats a bit more moderately. Yesterday we ran out of milk and he said, “Well, I guess I’ll use half and half instead.” And I’m counting the calories of carrots! Yet so far we’re tied. Ugh.